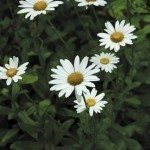 I have several areas of shasta daisies. They start out looking great but about a month into growing they start falling to the sides and some in the middle die. Now when I look in the center of the area, there are the stems with the heads of the daisies having fallen out to the sides so that there is a large bare circular area in the center. This normally happens because the plant do not get quite enough sunlight and they have weak stems. If you can get them more light, that would be helpful. You may also have an animal bedding down in the flowers at night. This will create a circular pattern of flattened plants and kill the plants in the center.